$125.00 In stock - low quantity. Order in the next 18 hours, 9 minutes and it will go out today! In stock - low quantity. Order in the next 18 hours, 9 minutes and it will go out today! This is an updated and modified version of the classic Farmyard Frolics (Edwin Hooper) style children's effect again with a twist. 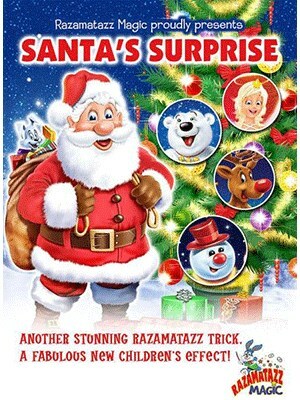 Great festive fun routine where Santa vanishes and appears in a funny comical routine with a different ending to the original style of effect. After Santa vanishes, the magician can't see him peeping out the side and the top of the house. There is much audience participation as the children waste no time in shouting out where he is. Trick concludes with a magical ending. This is a great trick with a Christmas magical theme for today's children's entertainers. Modern, colourful and keeps the children laughing and shouting in a controlled way that is a fun to see. You will be amazed at how stunning this looks. Never before has a children's Christmas prop looked so good. A picture of a snow covered house is shown. When the children are shown inside all they can see is a bare room with a sad looking Christmas tree with no decorations, baubles, lights and worst of all no presents. The children are encouraged to shout out what items are missing from the tree. The magician now looks for Santa but cannot be found so some of Santa's friends are introduced one by one and each character is holding something nice to decorate the tree. Santa appears and the children are asked it they would like him to do some Christmas magic. Of course they say yes so Santa is made to vanish followed by lots of fun where the children see him peeping out of the side of the house, every time the magician looks he pops back inside so does not see him. Eventually the children are asked to say the special Christmas magic words and Santa now appears with all his friends in the same room but now the Christmas tree has been transformed and is beautifully decorated and presents can be seen at the bottom - Merry Christmas Everyone !!! In the pack you will receive an attractive giant magic snow covered house and set of Christmas character cards with the most beautifully illustrated festive characters you will ever see in any children's effect, again all superbly made. The whole set comes in it's own special hard wearing PVC carry case for easy transportation. Which will help protect your set for many years. This is an absolute must for any professional or amateur children's entertainer and an ideal addition to any children's and family Christmas shows.